I get asked sometimes to show how I work. Usually, the process is difficult to describe. While I work, I often do not know if it will be a success or a failure yet. It is hard to justify spending hours documenting something that is not guaranteed to work out. In this case, I have decided to write notes while I was working on the project. The project is a fun idea; the result is not very important. 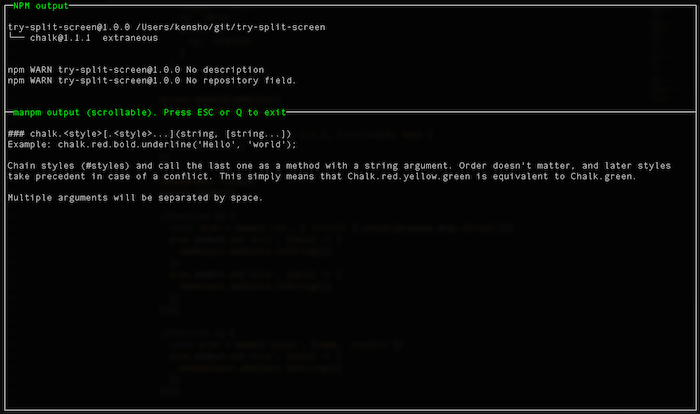 Even if the result CLI application is a novelty, others might benefit from the process write up. Idea: npm install wrapper that opens a new gif every 5 sec during install to make it feel faster. Ok, this might sound like a joke, but one guy implemented it right away. Check out https://github.com/vdemedes/gifi by Vadim Demedes @vdemedes - who is awesome developer in my opinion. It plays GIF loops during the install by opening the gif in the browser. Cool, right? Yet, I think we can make it a little more useful - I am only partially ok with gifs (or cat pictures). Think about all the useful things we could do in the terminal while waiting for the NPM install to complete. For example, we could show a section of the README document that describes how to use the module. Or show examples. 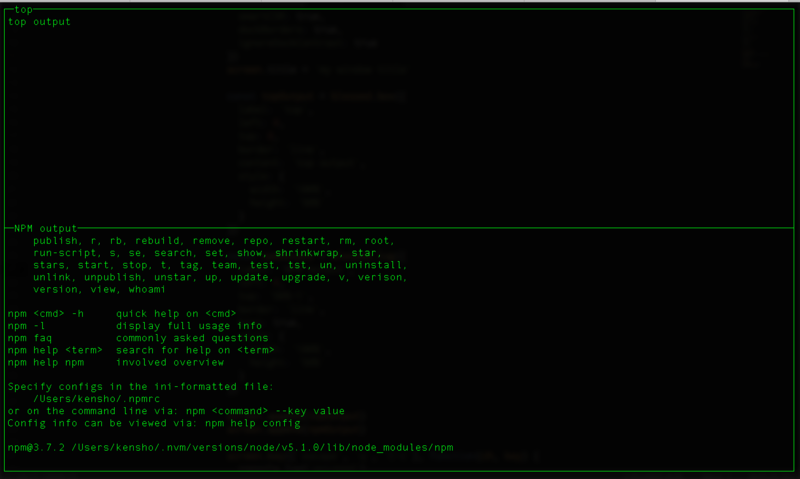 I already tried displaying a part of the project's README from the terminal, see manpm. It would be great to divide the terminal into two parts, show the regular npm install in one part, and the "install", "use" or "example" part of the README in another half. Another possibility would be to show an terminal screencast movie using asciinema by Marcin Kulik @sickill - it is tiny, and could be very useful! The code to put two horizontal boxes inside the terminal is simple. Here is the code with static text. The bottom text changes and redraws itself, see first.js for full source. Ok, the static text is simple, but how do we change the contents of the box based on the changing output of a child process? Luckily, we can easily modify text inside a box as it changes. Let us run a command and show its output in a box, and to avoid any Windows problems, let us use cross platform spawn module right away. We can use blessed log widget to add scrollable text to the screen. See second.js for full code. Now we have simple NPM output and it is even scrollable! Let us add the output of manpm command (like hardcoded manpm obind example) and allocate more space to the example, rather than the NPM output. Full code is in third.js, here is the important part (and it mimics) very much the way we implemented NPM handling. 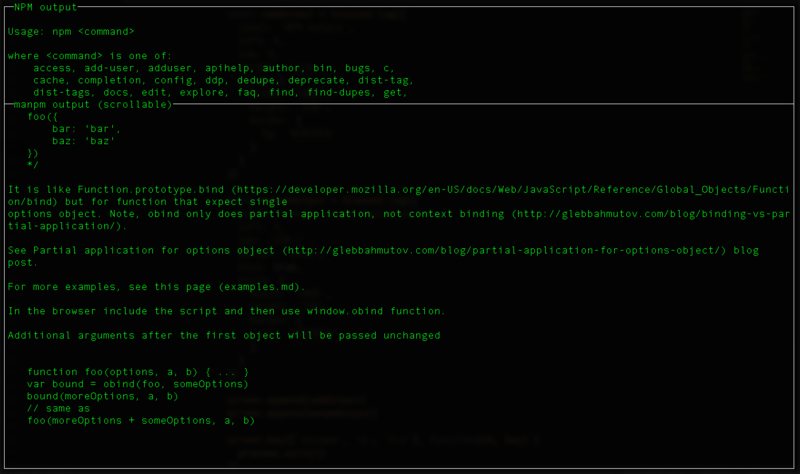 A good feature of manpm - if a section with the exact text match is not found, the entire README text will be searched. If nothing matches, the README is displayed. All we need now is CLI parsing and we have ourselves a tool. There are lots of CLI parsers, but in this case we can just find the argument that is not one of the install|i|--save|--save-dev|-S|-D keywords. Once we find the module, just pass all arguments to the NPM install, and just the name to manpm. A little bit of styling, and the tool is ready. After a little bit of searching for available NPM name (use namely to find available variants) I settled on "wiseli", formed by combining the expression "use time wisely" and the verb "install". Nice, now I can try using the tool myself to find any problems or usability issues. I should also go through the NPM checklist to clean up the loose ends. These 3 bullet points fit nicely to what I have written earlier about becoming a better hacker.